Pisces: Book 1 (The Zodiac Twin Flame Series) by Rachel Medhurst is a young adult paranormal romance. Pisces and her eleven brothers and sisters are named after the sign they were born under. Their mission in life is to unite with their twin flame, or soul mate, and spread the example of true love to all of Earth. They are fought by the Dysfunctionals who try to keep them from this mission. So they are each given a guardian. Antony is Pisces' guardian and there are no immediate flames between the two of them. Their love is a slow simmer. He was nothing like Pisces had imagined her true love to be. But when he started to run, she discovered that she must chase after him in order to complete her mission. 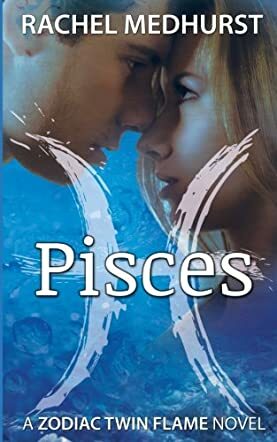 Pisces: Book 1 (The Zodiac Twin Flame Series) by Rachel Medhurst is a very interesting, unique story that I think will take readers by surprise. It is not your typical romance, but romance readers will enjoy the slow burning love that ignites between Pisces and Antony. I loved the characters in this story. They were very well written and seemed like they knew exactly what they wanted. Pisces struggled with completing her mission and sometimes wanting to be selfish and just live her life like a normal teenager. I think teenage readers especially will be able to relate to her struggles and wonder why there is so much pressure on her.